Rob Tillett presents a short description of the astrological meaning of the planet Neptune, the great deceiver, master of disguise, deception and delusion – and harbinger of spiritual growth. Neptune, the planet of deception, delusion and spiritual enlightenment, rules the oppressed and abandoned: the misfits of society. On a higher level he rules visionaries, and those who are glamorous and charismatic. Neptune represents spirituality, mysticism, and ideals. Neptune is invisible to the naked eye, and was officially discovered on Sep 23, 1846, by Johann Gottfried Galle, working at the Berlin Observatory from theoretical predictions by the French mathematician, Urbain Le Verrier. There is disagreement as to the actual time of discovery, ranging from 10 PM on Sep 23 to early on Sep 24. Typical of the confusion surrounding Neptune is the existence of a number of previous observations by astronomers, including Galileo, but obtaining no actual identification of it as a planet. And so there was much controversy, even deception, over the discovery, with particular criticism coming from the British, who were great rivals of the French. Neptune has recently been experiencing its first full orbit of the Sun since discovery! This suggests a new spiritual dispensation, especially since this mighty force is now entering Pisces in the tropical zodiac (although remaining in Aquarius in the sidereal zodiac for years to come). To find out how Neptune and all the other planets directly affect your personal life, you need to order your own horoscope from this website! Neptune slowly transits Aquarius between November 1998 and February 2012, with a brief visit to Pisces from April 4 to August 5, 2011. Neptune then returns to Aquarius for 6 months, before moving into Pisces for the long term on February 3, 2012. Why not check out Neptune's transit through Pisces. 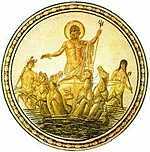 Because Neptune, being invisible to the naked eye, was first discovered in 1846, there is no traditional rulership or exaltation. Modern astrologers generally agree that Neptune, Lord of the Sea, is well-placed in Pisces, sign of the Fishes, and may be said to be the co-ruler of that sign, though Jupiter is definitely the traditional ruler.